Use amazon echo to start your car, and keep it warm and toasty on winter morning. Using your voice to control everything has always been very interesting. With my shiny new echo I could connect all the usual "connected home" devices, but I really wanted the echo to keep my car warm and toasty on a winter morning. 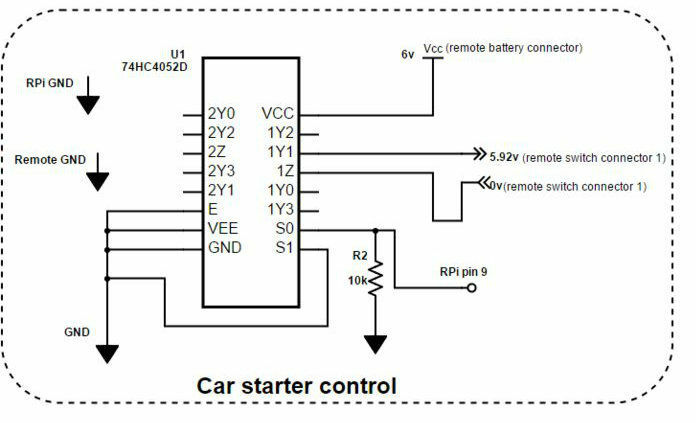 In this instructable we are going to make the Amazon Echo start any car. We will do this by programming a Raspberry pi zero to act like a Belkin Wemo switch, named My Car. You can then ask "Alexa turn ON my car"
Open up the remote starter remote and disconnect the battery before you start. You could get away with connecting two wires on the opposite sides of the start button on your remote [shown in pic]. Every remote is wired differently, and you might have to figure out which two leads of the switch short when the start button is pressed. Also make sure you draw out the battery positive and battery negative(GND), this will power the 74HC4052 (Analog Mux). Now build the circuit shown in pic. This IC can support multiple buttons, but we are only using one channel right now. Make sure you short the enable pin to GND. Now all you need to do is clone this repo to your home directory on the raspberry pi. Go to settings>connected home on the alexa app and run "Discover devices". You should see a device "My Car" show up on the list. Now go ahead and ask Alexa to turn on your car. If it does not work the first time, retry "Discover devices"
also run "sudo raspi-config" and enable wait for network option (4) - assuming you have already setup the wifi or Ethernet on the pi zero.